Pretty Slips, Sweet Hearts, it's February 1st! I like keeping things simple. At the beginning of 2010, I renovated the blog big time. It's kind of like doing a clean sweep, clearing out the clutter feels really great. In the same way, I'm enjoying organizing the Love Lune line I've been developing over the past 8 months. With this, I've made the growing collection a bit easier to browse and access. I'm still working on the gallery aspect of the little online portfolio for LL, but it's a start. Check it out HERE. I've been working on a Studio Lune update, and included are a few slips exclusive to the site, but I've also added several brand new dresses and skirts to the ilovelune.etsy shop. Included in the Studio Lune online shop update coming this week is something SOOO perfect for the season. 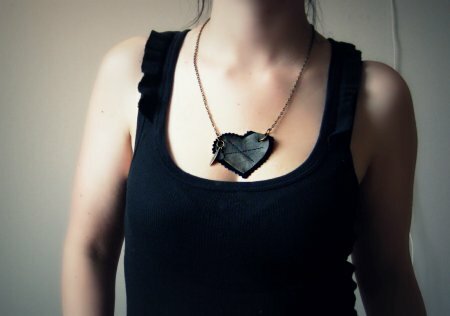 Detailed chain, leather, fabric, and charm heart shaped necklaces by Dizzy Dame. Tough but pretty. There are only a few of these (5 to be exact). If you wanna snap one up before they're listed, let me know in this post with your email and I'll send you an invoice with the details. 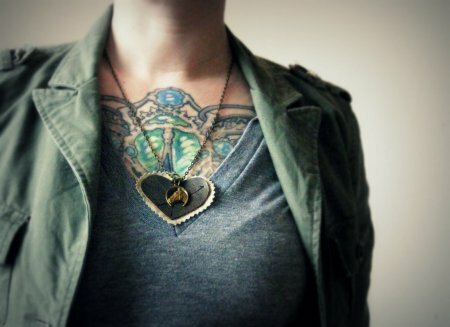 Each heart necklace is $25 CAD + $4 ship. Mel takes such care in everything she creates, it's impossible to not be impressed with her work when it's in hand. It's going to be a pretty sweet February, don't ya think?